There's a Cards Against Humanity-inspired game for parents and we want in! There’s a Cards Against Humanity-inspired game for parents and we want in! 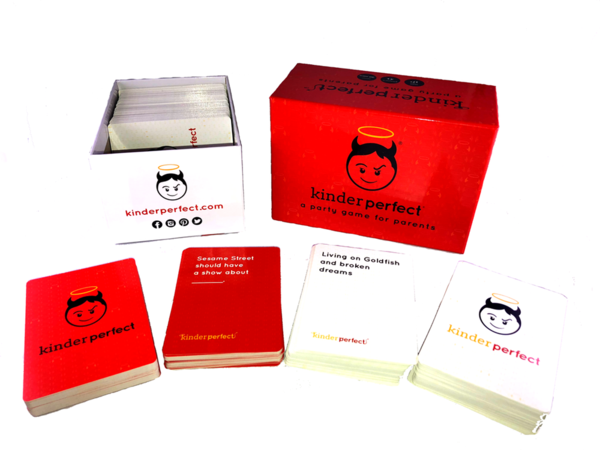 Crowdsourced from actual parents, the KinderPerfect card game pays homage to the excellent Cards Against Humanity, and take it up a mum-and-dad-focused notch. The passion project of US couple Amy and Wayan Vota, KinderPerfect sprung from the pair’s experiences parenting nine-year-old Hanalei and eight-year-old Archer – with a little extra help from their friends. This excellent success story began when Amy and Wayan started adding their own homemade parenting-themed cards to their already much-loved Cards Against Humanity deck. Because they are creative and enterprising types, making their own cards seemed the logical fix! The homemade cards proved so popular with their family and friends that they eventually put their original Cards Against Humanity deck on the back burner, and played solely with the mum-and-pop-specific cards they’d dreamt up themselves. The popularity of their guerrilla-version of game amongst their pals convinced the Votas that they were onto something big. They launched a successful Kickstarter crowdfunding campaign, so they could manufacture and market their cards – and now the game that started in their living room is an actual gosh-darned thing! Yep! Now you too can snap up your own deck of KinderPerfect cards, and cheerily celebrate/commiserate your mum or dad life, as you play the game with your buddies. Regale them with tales of vomit, wee, lost sleep, dummy spits, scanctimommies and bake sales. Oh, the fun you’ll all have! They start so early… and never stop! The packs are on preorder now and begin shipping next week – on November 20th. They contain a whopping 400 question and answer cards aimed squarely and expertly at people who look after small children (and sometimes want to hide in the pantry eating biscuits and have their old life back for just one second). The KinderPerfect deck costs $24.95 US (around $32 AUD) and you KNOW you want one! Ace work, Amy and Wayan!